The protracted fight over the use of Native American mascots in Maine public schools made it to the State House on Monday, less than a month after the last school district in the state retaining such a mascot voted to change it. The bill, LD 944, from Rep. Benjamin Collings, D-Portland, would unilaterally bar Maine public schools from adopting Native American names, symbols or images for use as mascots, team names or logos. 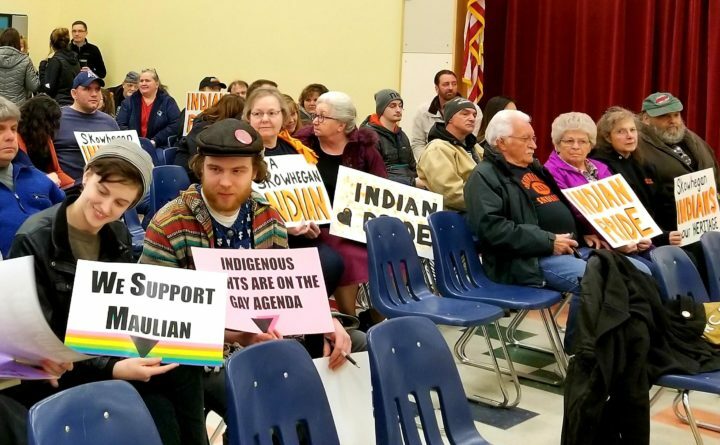 Though the bill would apply statewide, many who testified Monday before the Education and Cultural Affairs Committee were from Skowhegan, where on March 7, the school board voted to permanently remove the “Indians” mascot from Skowhegan High School, capping years of contentious debate and reversing a decision made four years earlier. In December, newly elected Gov. Janet Mills, a Democrat, penned a letter supporting the mascot change. “Am I honored to be a mascot? No,” former Penobscot Nation chief Barry Dana told committee members, refuting the notion that mascots honor Native American heritage. “I agree: This should not have to be state law. As decent people in society, we should not be asking our leadership to protect us,” but that’s not the reality, he said, in testifying that a state law is necessary. In the days since the March vote, opponents circulated a petition asking for the Skowhegan mascot name and symbol to be reinstated. Some of them testified against Collings’ bill. Still, others argued that retaining a Native American mascot in Skowhegan was an honest gesture to preserve that history. Removing it, Skowhegan middle school tutor Gloria Gordon said, would take rights away from non-Native American students who want to keep the mascot. Penobscot Nation citizen Sherri Mitchell, an indigenous rights and policy attorney, said using mascots to depict indigenous people doesn’t honor them. Instead, mascots “perpetuate negative stereotypes and disregard for native personhood,” she testified. The bill will be considered next in a work session, where committee members could vote whether to recommend passage of the bill to the full Legislature. Correction: An earlier version of this report incorrectly stated that Skowhegan residents voted to remove the “Indians” mascot. The school board made that decision in a weighted vote.